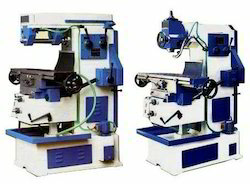 Prominent & Leading Manufacturer from Batala, we offer milling machine. Valued as a reliable and trustworthy manufacturer, supplier and trader, we are engaged in offering premium quality of Milling Machine to our valuable patrons. These machines are used in various milling processes and are known for their rich attributes such as energy efficient design, robust construction and energy efficient design. In addition to this, these machines are easy to operate. Table Rotation Side to Side 45"-0-45" 45"-0-45" 45"-0-45"
Looking for Milling Machine ?